Palo Alto is one of the world’s great centers for technology and innovation. Whether it’s venture capital, computers, telecommunications, social networking, or biotech, Palo Alto is the engine that turns ideas into reality. Located halfway between San Francisco and San Jose, Palo Alto is the place in Silicon Valley where everything seems to happen. Unlike their more suburban neighbors, Palo Alto residents enjoy the opportunity to stay connected to the pulse, while still maintaining a sense of seclusion and privacy. While most famous cities are founded near natural resources, Palo Alto was founded upon something even more precious: human progress. This elevation of ingenuity and the human spirit runs through the city like a current of creative energy. In Palo Alto’s vibrant community, knowledge and business ideas are an integral part of daily life. While many affluent cities have vast properties and landscapes that separate neighbors, Palo Alto’s layout connects people. As a hub of innovation, Palo Alto has a gravity that naturally draws influential people and ideas to its center. Even those who live outside the city’s borders are drawn to its myriad restaurants and bars as meeting places for business and socializing. With Palo Alto’s low-key, accessible attitude, you never know who you might run into or what connections you will make here. In keeping with its foundation as a center for learning and innovation, the city is home to Stanford University as well as some of the most highly regarded public schools in the country. Most Palo Alto children attend their neighborhood public school, where they walk or bike to school, contributing further to Palo Alto’s strong “small town” flavor. 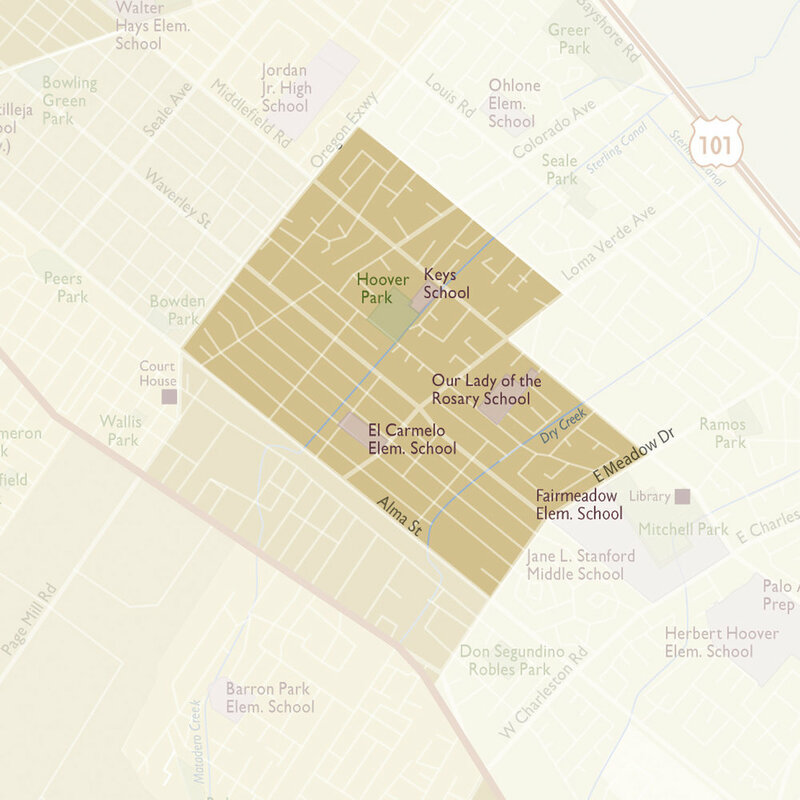 Palo Alto has a Unified School District which administers all education levels. In addition to the well-known neighborhood public schools, a number of choice programs are available to residents, as are several wonderful private schools. Located in the heart of Palo Alto's College Terrace neighborhood. Large, 11,000 square foot lot right on Stanford University's doorstep. Ideal investment or development opportunity. Located in the heart of the Professorville neighborhood, this stunning home has been remodeled while maintaining its original Victorian detail. As one of Palo Alto’s smaller neighborhoods, Green Acres residents enjoy a feeling of connection and familiarity with their neighbors. Once home to apricot orchards, Green Acres was developed in two stages in the 1950’s. 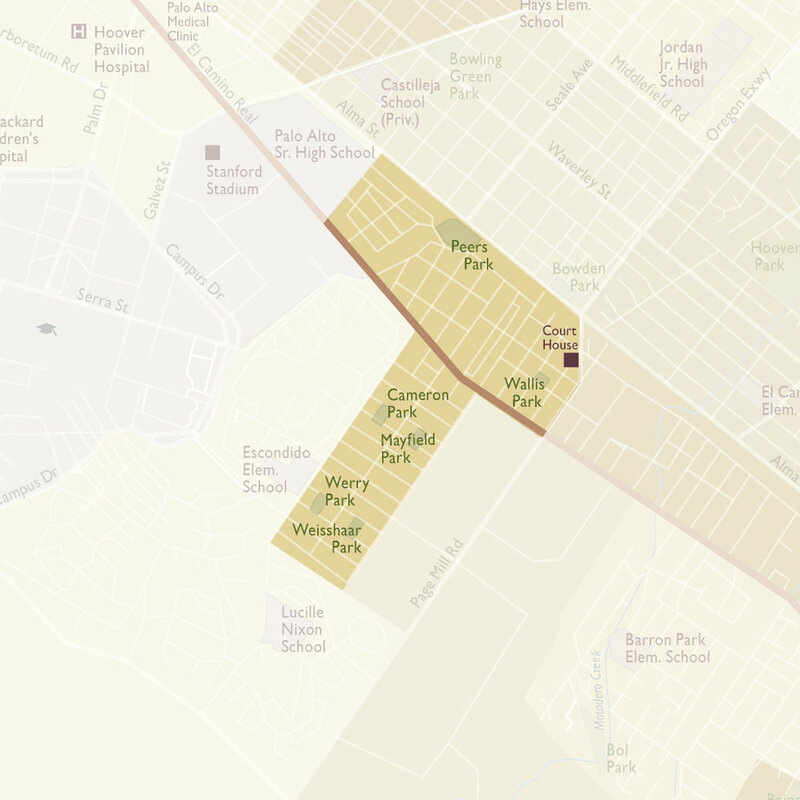 The MLS area also contains the adjoining neighborhood of Palo Alto Orchards, another 1950’s development. All homes in these neighborhoods are within walking distance of the elementary, middle and high schools, as well as Juana Briones Park. The College neighborhood offers a convenient location blocks from both California Avenue shopping and Stanford University. Traffic circles and street blocks give the neighborhood the feel of a giant cul-de-sac. Peers Park serves as the neighborhood’s playground and gathering place. Architectural styles are a mix of a few turn-of the century homes, 1930’s bungalows and recently built homes. The College area includes the neighborhoods of Southgate, Evergreen Park, College Terrace, and Mayfield. Each of these neighborhoods has its own unique character. With its proximity to schools, services, restaurants and downtown businesses, the Community Center neighborhood attracts families, young professionals and empty nesters alike. Rinconada Park, with its large community pool, playgrounds, picnic areas and tennis courts, is just across the street from the Rinconada Library and Palo Alto Art Center. Down the road, the Lucie Stern Center houses the Children’s Library, Children’s Theatre, local community theaters, and the popular Junior Museum & Zoo. Green Gables is a collection of neighborhoods often referred to by the name of the school that serves as a common hub: Duveneck. With a mix of pre-war ranchers and post-war Eichlers, Duveneck is a place where people put down roots and stay awhile. It’s a neighborhood where young families can find a starter home and later move up on the same block. Midtown is a popular neighborhood located, as its name suggests, in the middle of Palo Alto. This central location makes it one of the city’s most convenient neighborhoods. That fact, coupled with its late 40’s and early 50’s bungalows and ranch homes, makes it a popular pick for those seeking a know-your-neighbor location. Old Palo Alto matured as a neighborhood before tract housing and even automobiles, so architectural styles vary widely. Homes are located within walking distance of nearly everything in Palo Alto. For many established entrepreneurs, an Old Palo Alto address means you’ve made it. Residents value the unpretentious and close-knit feel. 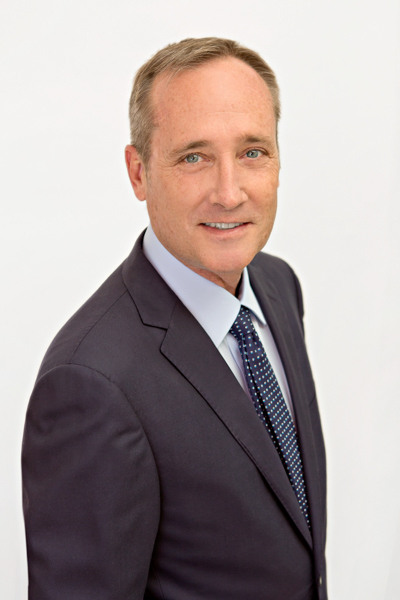 In addition to the extensive Palo Alto Hills region, this MLS (multiple listing service) area includes the neighborhoods of Greater Miranda and Esther Clark Park. All these neighborhoods are known for their rural feel and acre lots. 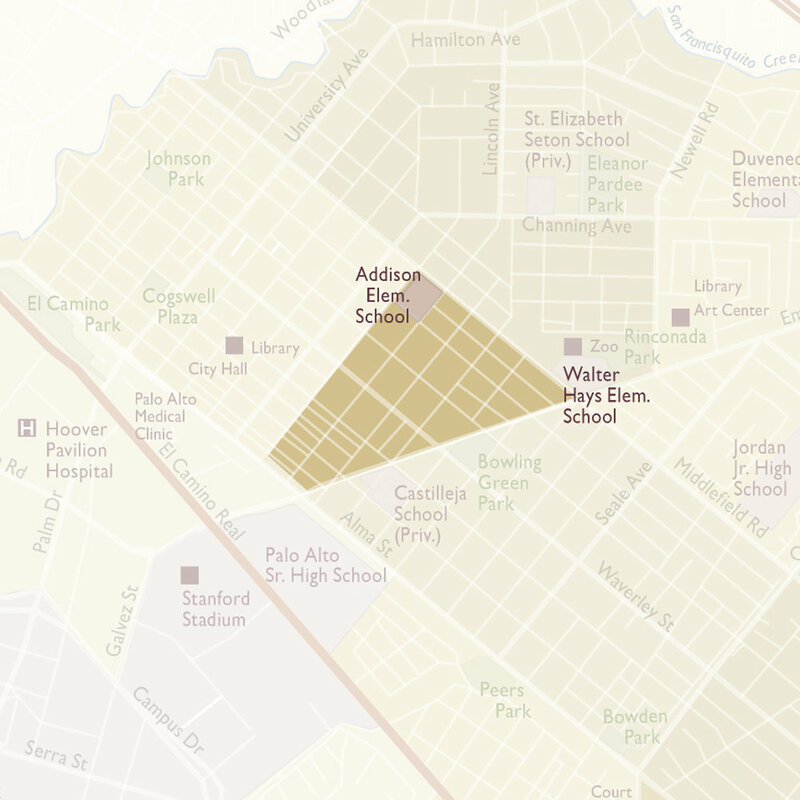 The neighborhoods have more of a connection to the adjoining city of Los Altos Hills than Palo Alto, but all enjoy Palo Alto schools and services. Blocks from Palo Alto’s city center, Professorville is a highly sought-after address due to its charming, genteel feel and easy access to the bustling action of downtown. The neighborhood offers an eclectic array of turn-of-the-century architectural styles including Queen Ann, Classic Revival and Craftsman Bungalows, as well as a rich collection of historic Shingle Style homes. 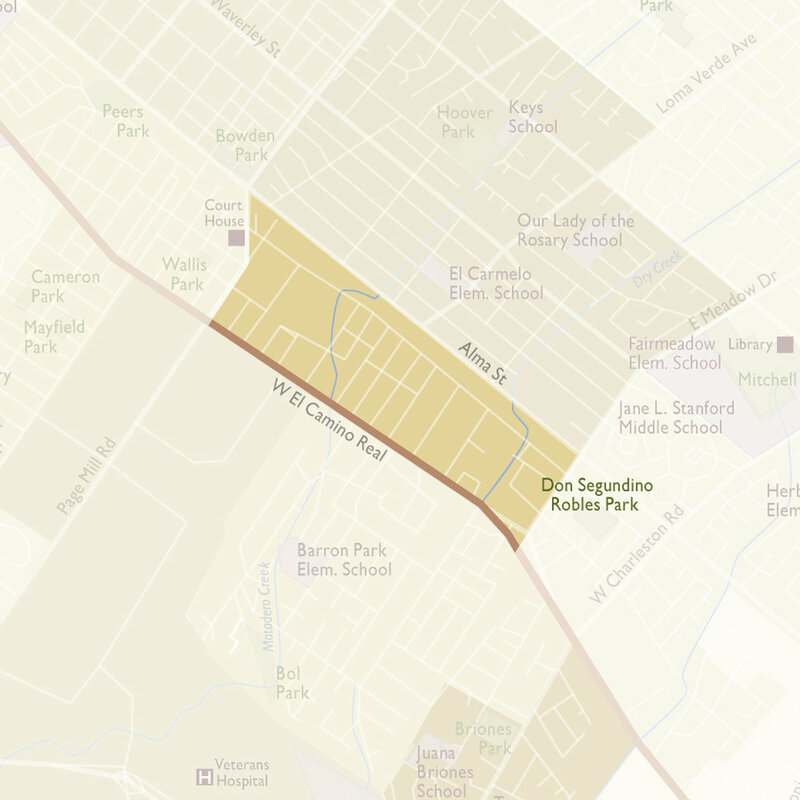 The South Palo Alto area of the MLS is a catch-all for the various neighborhoods built east of El Camino and South of Oregon Expressway (with the exception of Midtown) in the early to mid 1950’s. A mix of early 50’s ranchers gave way to mid-century Eichlers as the last part of Palo Alto was developed. Each neighborhood has its own unique flavor and home styles. The Stanford neighborhood is Stanford-owned land that is leased to provide housing for qualified faculty. A series of picturesque neighborhoods comprising 750 single family homes and approximately 200 condominiums that wrap the campus, the housing stock varies from turn-of-the-century homes to mid- century and ranch styles built in the 40’s and 50’s and 60’s. The Ventura neighborhood’s proximity to El Camino and California Avenue shopping make it a convenient place to get started in Palo Alto. The smaller lots have seen less new development than other parts of the city, but that’s changing as recent new construction finds its way among the traditional turn-of-the-century and 1940’s bungalows. Barron Park, the southwest section of Palo Alto, has always had a rustic, pastoral feel and still offers a bit of a country life in the midst of urbanity. Nothing points to this character more than the two donkeys that live in Bol Park and are cared for by local volunteers. One of the donkeys, Pericles, served as the model for Shrek’s famed sidekick in the Dreamworks movie Shrek. TO INQUIRE about one of our listed properties, or regarding selling your home, CONTACT ONE OF OUR AGENTS or INQUIRE USING THE FORM.